CNNMoney.com > Small Business > Money & Main St.
As staffs shrink, business owners are taking on support duties they haven't had to handle in years. SkirtSports' first employee shipping out piles of orders -- a task that the CEO helped out with in rough times. 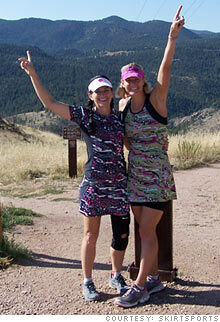 SkirtSports owner Nicole DeBoom and one of her sales reps, on a trail run sporting their signature gear. Rebecca and Nicholas Aguilera have had to lay off half of their staff, leaving Nicholas to pick up the production manager duties. With job prospects bleak, many people in Detroit are deciding to start their own business. How have your health care costs changed in the past few years? NEW YORK (CNNMoney.com) -- Small businesses have shed an estimated 1.6 million jobs this year. That leaves the remaining staffers to pick up the workload left behind -- and even bosses are pitching in. With their employee rosters cut to the bone, business owners are going back to the basics, re-learning to do tasks they may not have handled in years. For Nicole DeBoom, founder of athletic clothing company SkirtSports in Boulder, Colo., that meant rolling up her sleeves to pack and ship customer orders. The last time she did that, shippers hauled packages to the post office. But her company had upgraded since then to a more automated system with UPS (UPS, Fortune 500), and the CEO didn't know how to print out the labels any more. CEOs don't normally have to work in the stockroom, after all. "They claimed that I mis-shipped more than anyone else and created more returns and exchanges," DeBoom says. "It's kind of fun when your employees can turn the tables on you and help teach you something." 'Hang in there': SkirtSports launched in 2005 and grew to 8 employees, but by October 2008, DeBoom had scaled the company back to five core employees, leaving her and another staffer juggling the work of a sales specialist on top of their normal gigs. The downturn in the economy and corresponding pullback in consumer spending stretched the apparel company and its employees to almost to the breaking point. "People were starting to get burned out," says DeBoom. "At this time last year, we instituted a no-raise, no-bonus policy until things cleared up a bit. We told everyone 'hang in there -- we are lucky to have jobs.'" Marketing took a back seat as DeBoom stepped up to help cover other parts of the business. "Going in and doing sales calls is a fairly natural skill for me, but I was rusty," DeBoom says. At trade-show expos, where SkirtSports set up booths showing off its products, DeBoom ran credit-card machines and rang up sales. SkirtSports has since regained some momentum, and DeBoom has been able to beef up her staff again so that she can refocus on the marketing strategy for her company. But not all small business owners are lucky enough to be able to hire again. 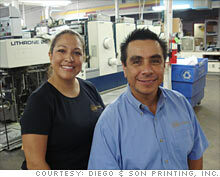 'We want this thing to work': Nicholas Aguilera, a co-owner of Diego & Son Printing in San Diego, Calif., has reduced his staff by half. With 11 employees left, the print-shop owner doesn't envision being able to boost his payroll anytime soon. His industry has been squeezed by the recession as corporations shrink their marketing budgets and move their remaining advertising dollars into online ads, cutting demand for the printed reports and brochures that his company creates, Aguilera says. Layoffs are never easy, but in a family-run business, it can be especially painful to let someone go. Aguilera was forced to lay off his 82-year-old aunt, who had worked for the company for 25 years. Aguilera himself has been working at the printing company since his dad opened the shop in 1972, when Aguilera was in junior high school. Employees who hung onto their spots have been expected to cross-train on other positions and take a 10% pay cut. The bosses slashed their own paychecks even more. "My sister and myself -- the owners of the company -- have cut our pay by 20% to let the employees know that we want this thing to work, and we will cut as much as possible," Aguilera says. In the name of saving pennies as employees watch their paychecks shrink, Aguilera got rid of the front-office aquarium because maintaining it cost $60-$70 each month. And the company's office space is being moved to the back portion of its production space, so they can rent out the office for additional income. While he has held every rank and position in the company in the 37 years he's been working there, it's been a while since Aguilera has had to order paper. But when the printing press had to let go its production manager, Aguilera picked up the duty -- and the phone -- again. "When I first started, I was sweeping the floor and emptying the trash," Aguilera says. "I know how each department works. Being the owner, I kind of know a little bit of everything." That's the right approach: Small business owners should always be able to step in for any position, according to Jim King, state director for the New York Small Business Development Center, which coordinates a network of regional training centers. "In a small business -- if the business is a successful business -- you probably always have the manager rolling up their sleeves," King says. Funded in part by the Small Business Administration, development centers throughout the U.S. offer free counseling to aspiring entrepreneurs and established business owners. Those on the front lines say they're seeing a growing number of business owners seeking guidance on how to get by with shrunken staffs. "We have seen the layoffs already, and now it is trying to survive with what is left," said Ken Freeman, director of the Yuba Community College Small Business Development Center in Yuba City, Calif. But the owner can't do it alone. Small businesses ought to be constantly looking for ways to leverage the abilities of all of their employees, not just the manager, in tight times. Ideally, when job scopes expand, you want to match staffers up with additional duties that mesh well with their existing skills -- or the ones they want to learn. "Not only are they doing their job, but they are also doing another thing that they have a personal liking to," King says, "so you end up building on the strengths of the people you have." 'Nobody was buying anything': For some business owners, getting back to basics means taking a "regular job" for a while. "When gas went up to $4 a gallon, it was like they turned a switch," says Tom LaConte, the former owner of printer-fixing company Laser Tech of Pensacola Inc., in Pensacola, Fla. "Nobody was buying anything, nobody was getting anything fixed, nobody was copying anything anymore." The printer company was the family's livelihood for 19 years, but as the economy deteriorated and customers stopped coming in the door, Tom had to find another source of income. "This last year, year-and-a-half, sales went down tremendously, to the point where we were getting behind on our mortgage. Our credit scores were going down. We couldn't handle both sets of bills," says Ginger LaConte, Tom's wife. Tom got a job working as a computer support specialist at the Department of Veterans Affairs and left the company to Ginger, who became the official owner of the store -- which she renamed Mr. Ink Refills. Ginger was originally the customer service representative for her husband's company, but she has since had to master aspects of running the business on her own, including fixing the computers herself. Looking ahead: Running on a shoestring can be the only option when money gets tight, but it's hard to sustain over the long haul. When business owners come to him for help, Freeman recommends that they create a long-term plan to get the business back on track -- taking into account the new economic realities. Then, he advises setting aside 15 to 30 minutes a day to work toward the goals mapped out in the plan. Proud business owners have a hard time asking for help even in tough times, and so when small businesses shed staffers, owners often take all the extra responsibility on their own shoulders. But sharing the load with others can be the best thing for all involved -- and for the business. "There are only so many hours, and so many things you have to do," Freeman says.